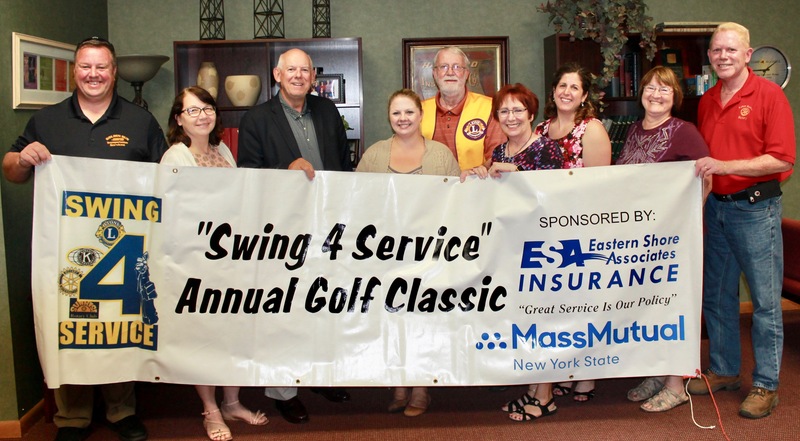 FULTON – Fulton’s Lions, Kiwanis, Noon Rotary and Sunrise Rotary clubs have partnered with tournament title sponsors Eastern Shore Associates Insurance and Mass Mutual – New York State, for the ‘Swing 4 Service’ Ninth Annual Golf Classic, Aug. 18, at Emerald Crest Golf Course, Palermo. 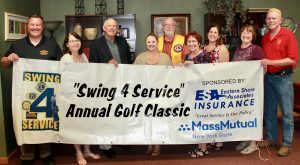 Among the event organizers and sponsors are (from left): Patrick Kinane, president, Fulton Noon Rotary; Bridgette Seguin, Noon Rotary and claims manager, ESA; Bob Wallace, CEO and chairman, ESA; Becky Kimberly, Noon Rotary; Bob Weston, Fulton Lions Club; Roberta Dunn, Kiwanis, and vice president, Fulton Savings Bank; Kimberly Allen, operations manager, ESA; LaVerne DeLand, event treasurer and Sunrise Rotary; and Doug Stevens, event chair, Sunrise Rotary. The event features an 8 a.m. shotgun start with a best ball captain and crew format. An awards banquet will immediately follow at Tavern on the Lock, Fulton. Deadline for team registration is Aug.10.